Amos Harvey of Bethel, Oregon is often credited with establishing the first congregation of the Stone/Campbell Movement west of the Rocky Mountains. 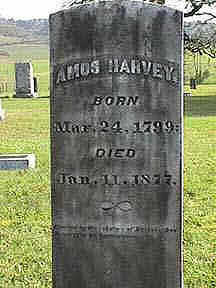 Harvey was acquainted with the Campbells, having been born and raised in Washington County, Pennsylvania where Thomas and his son Alexander Campbell lived. He was 10 years old when Thomas Campbell published his Declaration and Address document that was fundamental to the early movement of "Christians only." He would have heard the spirited discussions about the new church group in the vicinity. Knofel Staton has written a Paraphrase of Thomas Campbell's Declaration and Address at this link. Amos' religious heritage was Quaker and he followed this way carefully, being a student of the Scriptures. But he was also taken up with the exceptional language abilities of young Alexander Campbell. He became a regular reader of the Christian Baptist and all of the writings published by A. Campbell. When Amos Harvey was 33, he came to love Miss Jane Ramage and asked her to marry him. She was 12 years his junior. The bride price he paid was being expelled from the Quaker Movement. However, Amos and Jane agreed that, when married, they would read and follow the Scriptures, wherever that exercise should lead them. The reading raised doubts immediately about his Quaker beliefs and after completing reading he, along with Jane, were ready to be immersed into Christ. This was carried out by Dr. A. W. Campbell, uncle of Alexander Campbell. Their pioneering spirit took them first to the Midwest. Harvey became an elder at Oxbow Prairie, Illinois. Soon the decision was made to continue on to Oregon Territory. Other Christians and Christian leaders were in the wagon train that left Missouri in 1845 for "The Land of Eden," as it came to be called. The overland trip took six months. Most of the wagon trains left Westport, Missouri about May 1. They had to wait until the winter floods subsided and the grass had grown enough to feed their oxen and other animals. The Harveys used two wagons for the journey. They had at least one child by then, a daughter named Sarah who later married John D. Kelty. When Sarah died early in the marriage, John married her sister Jane. The Keltys, in turn, had a daughter named Ethel who moved to Vancouver, WA. In the 1960's this scribe conducted her funeral at Vancouver. We went with the body to the historic Bethel Cemetery on the old Amos Harvey Donation Land Claim (DLC) and had a graveside service. Ethel's daughter was then-U. S. Senator Maurine Newberger. But now we are ahead of the story. After reaching Oregon City, Harvey worked for the famous Dr. John McLoughlin at Oregon City for a short while, then came to the Dayton area, settling briefly near Lafayette, among the first towns in Oregon. Travel in the Willamette Valley in those earliest day was most reliably by water. The family came to the rich Yamhill River valley in January of 1846 and soon took up a Donation Land Claim in Plum Valley, just southeast of Bethel in Polk County. Sometimes the names were used interchangeably. The beauty of the land can be seen by looking to the left of the grave marker in the photo. They soon found several families of "Bible only Christians" and established a congregation of believers in the vicinity of Amity, south of present day McMinnville and four miles north of their DLC. The Amity congregation not only exists today, but has a rich heritage in following the authority of Scripture. The relevant portion of Amos Harvey's letter to the Millennial Harbinger is in the footnotes below. One early writer said of Amos Harvey: "He was duly beloved for his sterling integrity and Christian piety." His dream was to make higher education available to every young man and every young woman. This was realized in the building of one of Oregon's first colleges at Bethel. We discuss the school more in the profile of Glen Owen Burnett. There is also a photo of the Bethel College building. A great tribute came from the pen of Amos Harvey's neighbor, Glen Owen Burnett. He described walking to church one morning. We still remember the rambling pathway as it stole along, winding its way to suit the projections of the hills as they reached out into the beautiful valley. On our left about midway and some half mile from our path lived an old disciple converted from Quakerism to the Gospel of Christ, whose hospitality and sympathy for the poor will never be fully realized until we all meet again "over there," still the memory of Amos Harvey will always be green and yield a sweet fragrance to the early settlers of Polk and Yamhill counties. For the full text. see the profile of Levi Lindsay Rowland. Amos Harvey led a long and full life. He became a noted nurseryman and was the first president of the Fruit Growers Association of Oregon. He taught English at Bethel Academy. Amos was a highly responsible part of community life, serving, among other things, as treasurer of Polk County. In 1845, the south border of Polk County was the California State line. Benton County was created the following year. When he was 65, Mr. Harvey was appointed to supervise the Grande Ronde Indian Agency. The government badly needed his skills as a horticulturalist. It was important to determine promptly the crops that Indians could grow for their subsistence. They had just been relocated to the area. At first he served on the Alsea River and then was transferred to Grand Ronde. Mr. Harvey is listed as living at Grand Ronde in 1867. He served well until he reached the mandatory retirement age of 70. Jane died during this time and was buried at the Bethel Cemetery. Amos held services at a church building in the Grand Ronde area and a group of believers reported from there at a later time. See details on the Polk County pages. Harvey gave, even beyond his means, to "help those who help themselves." Bethel College and his fellow preachers were judged worthy recipients. Even to less virtuous persons, when some need had sprung from unforeseeable circumstances, he would readily supply for it from his own pocket. Thus, when a winter supply of blankets went astray in San Francisco, Harvey bought replacements locally for those who would otherwise go cold. He did, however, take occasion of the blunder to upbraid the poor organization which had led to it. Thus, whereas Fr. Croquet lavished his all without question, Agent Harvey felt the obligation to inculcate the virtues of foresight and self-reliance. Hence he strove to ensure that each farming group would retain seed-grain for the next year's crop. He went further and lobbied for family farms, on which the head of each family would be directly responsible for its subsistence. Amos Harvey was not a circuit-riding preacher like the men who followed him. His great contribution to building the Lord's church was in a small radius of his home in Polk County, but his impact was a powerful and lasting one for the Lord. Mr. Harvey's funeral was conducted by G. W. Richardson. The text of the oration has been preserved among the family papers of a grandson, Daniel Clarke Robbins, and are in the Oregon Historical Society Library. Amos and Jane are buried in sight of the old Bethel grounds south of Amity. It was a touching experience in 1995 to gather with other saints at the Bethel Cemetery, stand in a circle around the graves of Amos and Jane, and sing the songs of the Zion. Some who gathered there were his descendants - they had at least eight children - and this marked 150 years since the Amity congregation had been started. We owe much to these self-sacrificing saints of 150 years ago. On that occasion, Jerry Rushford noted that more than 1,700 congregations of the Churches of Christ and Christian Churches are on the West Coast and the work began with Amos and Jane Harvey. Amos Harvey wrote to Alexander Campbell to clear up an inaccurate report that someone else had been submitted earlier and then he explained his presence and success. Mr. Harvey was very accurate with spelling, so the unusual spellings were probably those used in that time frame. I came to this country late in the fall of 1845, and learned that a few families of Disciples lived on Yam Hill, west of the Willamette river. I settled there in January, and in March we organized a congregation upon the Book alone -- and this was the first congregation built upon this foundation in the Territory. We numbered at first but thirteen members. We met, as the disciples anciently did, upon the first day of the week, to break the loaf, to implore the assistance of the heavenly Father, to seek instruction from his word, and to encourage each other in the heavenly way. Brother John Foster, who wintered at the Dalls, came in, in the spring, and settled on the Clackamus east of the Willamette and organized a small congregation, consisting of his own family and two or three other members. During the summer five persons in our neighborhood made the good confession, and were immersed for the remission of sins; and about the same number in the neighborhood of brother Foster. The imigration of 1846 brought two proclaimers (brothers Dr. James M'Bride and Glen O. Burnett) who, though encumbered with the care of providing for large families, in a new and uncultivated country, have spent much of their time in proclaiming the word. Their labors have been particularly blessed, and their success beyond any thing that could have been anticipated in a new and thinly settled country. The imigration of last year brought three other proclaimers. Our meetings are well attended, and generally more or less make the good confession at every meeting where the gospel is proclaimed. There are many calls from various neighborhoods which the teaching brethren are entirely unable to fill. Would to Heaven that we had a number more brethren of teaching talent and Christian character, to teach the way of life and salvation to an inquiring population! We now outnumber in the American population any of the sects, and if we only live up to our high profession, Oregon will soon become as noted for the religion of Jesus Christ, as it already is for its ever-verdant pastures, its grand and varied scenery, and its mild and healthy clime. Millennial Harbinger, 1848, page 702.